This week Leslie goes fifteen rounds in the ring arguing that tough guy Rocky is a Virgin’s Promise story at heart, while the opposition brings some heavyweight counterarguments. This 1976 Best Picture was directed by John Avidsen from star Sylvester Stallone’s Oscar nominated script. Leslie – Let’s start with Rocky’s Beginning Hook, Middle Build, and Ending Payoff. We all agree on the genre, but there are a few points that I need to establish to connect Rocky’s Sentimental plot with the Virgin’s Promise form. Status stories reside in the self-esteem and self-respect human needs tank, and this fourth layer of human motivation is thought to be connected with all the other layers (which is what makes these stories complex and delightful). Story Grid followers often express confusion about Status stories, which turn on the life value of SUCCESS and FAILURE, because those values seem to be moved by external factors, rather than internal ones. But these stories are about our personal definition of success, influenced from within and without, and what we are willing to compromise to obtain it, as well as how we react to opportunities and misfortune. The human need for esteem includes several ingredients, like the respect of others, but internal acceptance is a necessary prerequisite for external respect to take hold and make a difference. Friedman’s Cause and Effect Statement: When Rocky, a sympathetic and once promising boxer with heart but a naive worldview, is offered an opportunity to fight the heavyweight champion and accepts the help of a wise and experienced mentor, he can rise from being a bum leg-breaker to a contender willing to go the distance. Success results when a fighter stays true to their values and goes the distance, whether or not they win the fight. Rocky is a great example of the Status-Sentimental genre told through the lens of the Virgin’s Promise. The Hero’s Journey is Joseph Campbell’s monomyth, the result of Joseph Campbell’s study of myths and Jung’s psychoanalysis studies. But what is the monomyth? It’s the general template of story form, a collection of archetypes, or the universal images that are the unconscious contents of the human psyche, altered and customized according to historical, cultural, or individual circumstances. The monomyth is general, but we can zero in on the specific by choosing particular archetypal story forms. While the vast majority of stories loosely follow the hero’s journey, sometimes we that mold isn’t an ideal fit—much like Cinderella’s stepsisters trying to wear the glass slipper. 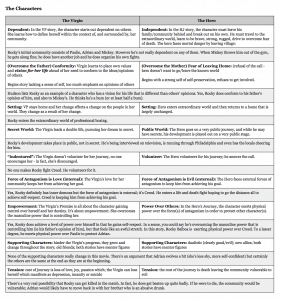 More narrowly tailored archetypal story forms might be the better choice, depending on your genre or the nature of the change your protagonist experiences. Campbell has done a lot for storytelling, and the monomyth is a powerful tool. But when the tale we want to tell is a more typically feminine journey of persistence and courage at home, it can feel like using a refractor telescope (with a lens that bends outward) when a reflector telescope (with a lens that bends inward) is what the situation calls for. Joseph Campbell said, “Women don’t need to make the journey … All she has to do is realize that she’s the place people are trying to get to.” [ahem] With all due respect, that realization is not always a matter of clicking one’s heels together. Perhaps the greatest obstacle on that journey is facing those who would prevent the protagonist from making the realization and expressing their unique gift that benefits the family or community. Thankfully, some conscientious minds have expressed their gifts by filling gaps in the monomyth. Some great resources include The Virgin’s Promise by Kim Hudson, From Girl to Goddess: The Heroine’s Journey Through Myth and Legend by Valerie Estelle Frankel, The Heroine’s Journey by Maureen Murdock, and Women Who Run with the Wolves by Clarissa Pinkola Estés. The Virgin’s Promise is the one we’ve used on the podcast before, so I’ll continue using that framework with additional explanations from the other sources. The Virgin’s Promise has been at work in several stories we’ve analyzed on the podcast, especially those from season two when we chose stories written or directed by members of groups underrepresented in Hollywood. But we haven’t always recognized the elements at work. There are four that I’ve identified as probable candidates, and what they have in common is a society element (not the global story) that creates a risk to one or more external life values at stake. In Hidden Figures, institutional and societal racism creates a greater risk to the lives of astronauts, as well as the risk of losing the space race. In Crouching Tiger, Hidden Dragon, sexism and classism within the culture and family force Jen to seek training outside of safe channels. In Brokeback Mountain, Ennis and Jack can’t safely commit to one another because of homophobic-fueled violence within the culture and their families. In Real Women Have Curves, family expectations about what a Mexican-American woman should be and do put Ana’s academic performance at risk. What’s the provenance for these Virgin’s Promise stories? Are they a modern construct postdating Campbell’s work? Frankel notes that there are as many heroines of ancient myths as there are heroes. Hudson and Frankel note that these story forms are carried forward and exemplified within fairy tales, whose archetypal images are echoed around the world and across the centuries. Frankel explains, “The most ubiquitous is Cinderella, the story of the persecuted drudge who becomes the greatest of all. This is the story that resonates across boundaries, as a fantasy of a better life.” Frankel quotes the work of Jack Zipes, who explains the specific type of change that happens over the course of the story. Perhaps the most striking feature of the tales is that at their beginning, the majority of the protagonists, whether male or female, are either poor, deprived, or wronged in some way. They come largely from the mercantile, artisan, or peasant class. By the end of many tales, these protagonists, whether male or female, experience a rise in fortune which enables them to win a wife or husband, amass a fortune and power, and constitute a new home. Frankel notes that when the protagonist is a female character, “this is a tale of bravery and constancy in the face of persecution, the woman’s struggle is for autonomy in the world of myth.” Enter Rocky Balboa, who is not a woman, but struggles to gain autonomy from culturally installed beliefs in Philadelphia, the cradle of liberty no less, in the aftermath of an international recession marked by stagflation, when high inflation and high unemployment went hand in hand. His story is Cinderella’s story dressed in boxing gear. Let’s take a look at how Rocky measures up against the conventions and obligatory scenes of the Virgin’s Promise. As Hudson notes, sometimes the obligatory scenes are established out of order, and some scenes are more anti-Virgin story in that the protagonist is resists bringing their true self to life. While the protagonist may be dependent on others for material survival, Hudson identifies other scenarios that satisfy this convention of the VP story. Keep in mind that the dependent world or domestic realm is a metaphor for the influences on [the protagonist’s] decision-making process. That impingement can be tangible or might take the form of belief or memories (e.g., in Brokeback Mountain, Ennis’s childhood memories contribute to his inability to commit to Jack). When the protagonist is praised for a specific quality or behavior (and ridiculed or criticized for the opposite), they can’t help but adopt the belief that acceptance within their family and social group is dependent on demonstrating a quality or performing in a certain way. The cost of conformity represents a loss of self or potential left unrealized. This cost can manifest in different ways. This is the protagonist’s first opportunity to express their true potential. It can arise in one or more of five ways. When directed by fate, a series of events happen to create opportunity. Rocky’s opportunity to fight the heavyweight champ was born of Creed’s necessity and chance. Creed’s opponent was injured and couldn’t fight, and no other pros were available. Unwilling to reschedule, and spotting the opportunity for a good story and show—not to mention an easy win for him—Creed decided to give a local underdog a chance and happened to like Rocky’s nickname, the Italian Stallion. This event in the story shows us that the protagonist really has a shot at reaching their potential. An aspect of their intangible dream manifests as a tool to assist them in growing into their true nature. This can be, but is not always a literal dress. Creed’s invitation to fight bestows upon Rocky the mantle of legitimate contender, suggesting he belongs in the world of professional boxing, and thus makes him appear beautiful. Mickey makes the case for the necessity of a manager and offers to fill this role for Rocky. Rocky demonstrates an aspect of the anti-virgin (reluctant to express the true self) when he “dresses for the wrong part” during a press conference with Jergens and Creed when they make fun of him. Once they have seen an external manifestation of their dream, the protagonist create a secret place in which the dream can grow. Now it’s true that everyone knows the Rocky is fighting Creed, but a major component of his training is done in private, early in the morning, away from the scrutiny (approval or disapproval) of others. This represents Rocky claiming personal authority to choose how he pursues his potential. Another aspect of the secret world is receiving love, and Rocky’s relationship with Adrian, in which they fill gaps, develops alongside his ability to see himself going the distance. Rocky no longer fits in the dependent world with Paulie, his old friend who pesters Rocky to put in a good word for him with Gazzo the loan shark. Rocky recognizes that Paulie’s violent temper and inability to keep his mouth shut could get him into trouble. Gazzo tells Rocky that he knows about the fighter’s relationship with Adrian. That relationship becomes open to public scrutiny. The protagonist can’t keep two worlds separate, and they collide. Paulie surprises Rocky by setting up an interview with a local reporter at the meat packing plant where he’s been training. Creed’s trainer watches him and realizes that Rocky is serious about the fight—more so than Creed. In essence, Rocky is caught wanting to shine, daring to think he has a real shot at the title when he encounters Jergens at the Spectrum arena. The protagonist must face and give up the belief and behavior that was the subject of the cost of conformity. Rocky drops the belief that he has to win to be successful and reaches a compromise. He will adjust his definition of Success to be going the distance with Creed, something that no one has ever done. This can be a difficult moment to dramatize because it is an internal awareness, but Stallone captures this perfectly in Rocky’s conversation with Adrian (a scene he fought to keep in the movie). As the protagonist changes, there is a ripple effect felt within the kingdom. Paulie, as a representative of the community, demonstrates the kingdom falling into chaos through his bad behavior. As Rocky and Adrian grow closer and Rocky embraces discipline in training for the fight, Paulie becomes increasingly belligerent. His friend is leaving him behind, and so is his sister, whom Paulie abuses. This bad feeling culminates in Paulie picking a fight (complete with baseball bat) with Rocky on Christmas Eve. Rocky starts to fight back until he sees his old friend is too drunk and weak. This is the opportunity for the protagonist to prove that they can express their gift outside the relative safety of the secret world. It’s one thing to pledge to go the distance and quite another to fulfill the promise against Creed. That is what Rocky must do to reach his potential. To get the huge payoff, he needs to go only three rounds with the champ, but to be successful according to his new definition, he must go the distance. This is represents an irreconcilable goods choice. If he chooses to fight and risk losing, the dependent world definition of success is no longer open an option. This is when the protagonist appears in true form before the kingdom. Rocky chooses to go the distance, that is fight all fifteen rounds (or get knocked out in the process), which is his own measure of success. The kingdom returns to order when the protagonist’s true value is recognized and is reconnected with the community. This is the moment when Paulie and Rocky reconcile, and he wears the robe. In a way this is a dressing the part reprieve. This is Rocky serving the community (Paulie) and expressing his true self (and a nice comparison to Creed’s outfit). This is the moment we acknowledge that evil has been uncovered and removed. The community as represented by Paulie is better off. Rocky’s rising tide will raise all boats. We see new life and enthusiasm injected into the community as demonstrated by the crowd at the Spectrum and the community watching in Rocky’s local bar. Anne – In The Heroine’s Journey Through Myth and Legend, which Leslie found and has been referring to, Frankel points out that there are three journeys in the Odyssey. The obvious one is Odysseus’s journey home. Then there’s Telemachus’s quest to find his father. Finally there’s the one that gets overlooked: Penelope’s inner journey of endurance and waiting. This holding down the fort, keeping the home fires burning, patient resistance to destructive outside forces–that feels like a key to the whole idea of the Virgin’s Promise or Heroine’s Journey. So I was especially struck by how steadfast Rocky remains to his neighborhood. Apart from running up the steps of the art museum, we only ever see him on his home turf. There’s one great moment that I thought portrayed this especially well. As he’s coming out to fight Apollo Creed, he’s wearing a beautiful red satin robe with The Italian Stallion emblazoned in gold across the back–a classic Dressing the Part Moment–but he’s not above ruining the overall a little. He’s added a cheap black and white patch to the back, advertising Paulie’s meat packing company. Rocky remains loyal to his people and the wellbeing of his community even in his most public moment. This commitment to bettering the world right where he lives is a key characteristic of a Virgin’s Promise story. From negative beginning to positive ending, Rocky’s abiding traits are endurance, fortitude, and patience. Even in his wooing of Adrian (which, okay, has not stood the test of time all that well), he shows more persistence than conquest. The same goes for his systematic training, right up to the final fight, where he must endure rather than conquer. When you think about it, even his pet, a turtle, symbolizes that slow and steady wins the race. He finds his true self without ever leaving home, and he betters his community in the process. Valerie – There’s no argument that Rocky is a Status > Sentimental story, and Leslie’s idea that the Virgin’s Promise applies to internal genres only, particularly Status, is intriguing and one we should definitely study further! However, while all Virgin’s Promise stories may be Status stories, that doesn’t mean that all Status stories will be Virgin’s Promise stories. Yes, the Virgin’s Promise story structure can apply to male protagonists and Hudson herself references Rocky twice in her book. She says, that Rocky is akin to a prince who is “born to a set of expectations that limit his ability to realize his personal vision for his life” (page xxiv). She also says that the Virgin “may have a spiritual need to reach for a sports achievement against impossible odds (Rocky, Angels in the Outfield)” (page 22). 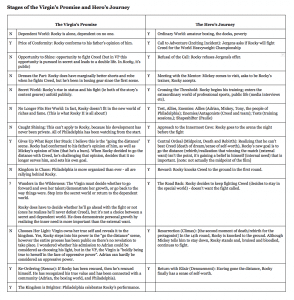 Yes, Rocky does meet some of the stages of the Virgin’s Promise (which I found fascinating!). However, while the character of Rocky Balboa may represent aspects of the Virgin (and these two things are key to the Status > Sentimental story), I don’t see the film Rocky is a Virgin’s Promise story. In fact, I think it’s a pretty straight-forward Hero’s Journey story. The only way I can illustrate my point is to compare both story structures. Rocky meet all the stages of the Hero’s Journey, but only a couple of those for the Virgin’s Promise. Both stories are about a character discovering who he/she is, but they unfold very differently. Jarie – Since I’m an engineer and all engineers love structure, I took a look at this as a decision tree of sorts. What’s a decision tree you ask? A decision tree is a method to systematically classify anything by asking questions about an object’s parameters. As an example, if you wanted to classify a basket of fruit, the first question you might ask is “Does it have a skin or a rind?” This then splits the fruit into two categories: ones with skin, the others with rind. As a general rule, you want to have the highest level question asked first so that you can split a set of things into a, hopefully, equal subset. If you don’t, then the question was not broad enough. In our fruit example, if your first question was “Is it orange?”, your two initial grouping might be skewed. Another thing about a decision tree is that you have to select the questions so that the overlap between the two sets is ideally none. For the fruit example, skin vs rind is a pretty good one since a fruit can only have a skin or a rind — it can’t have both. For the Virgin’s Promise discussion, you can do the same thing. If you pick the right first question then it can only be one or the other. In my opinion, you can’t have both since that defeats the purpose of calling them something different and then it gets muddled into a new thing or a confusing mashup that is hard to understand or follow. This is where the decision tree that I came up with on this debate comes in. It’s my contention that when it comes to classifying a story as a Virgin’s Promise or a Hero’s Journey or any kind of high level structure, it can only be one. You can then find out which one by asking some questions based on a decision tree. A full decision tree for all types of stories would be huge and cumbersome and I did not have time to build one. Rather, what I did build is the questions to ask in the decision tree to fork to the conclusion that the story is a Virgin’s Promise story. #1 Is the protagonist prevented or restricted from being independent or taking care of themselves? #2 Does tradition or social norms restrict the protagonist’s ability to get ahead? #3 Does the protagonist have a hidden talent that cannot be revealed due to social norms or traditions? #4 If the protagonist gets caught practicing their talent, will they be punished? If we take Rocky down this tree, we’ll soon see that it fails the test. Answer: No. Rocky can do whatever he wants and has no restrictions except for what’s in his own head. Since it’s necessary for a VP story to have a repressive force holding the protagonist back, Rocky fails that test. Therefore, the other questions don’t matter. It can’t be a VP story without that no matter how many of the other components it may have. For completeness, let’s look at the other ones. Answer: No. There is no tradition holding Rocky back. He’s a poor guy so there is social economic pressures but no one is preventing him from boxing. Answer: No. Rocky’s talent is boxing and going the distance. It’s not hidden at all. He’s a boxer, pure and simple. Answer: No. This followings answer #3 but since Rocky does not have a hidden talent, then he won’t be punished. Of course, we can disagree on the questions that I choose to use. That’s a fair point but still, when it comes down to it, a VP story is about a protagonist that is dependent on others, is restricted on getting ahead, and has a hidden talent that can’t be expressed. Miriam “Midge” Maisel (Rachel Brosnahan) is a Jewish housewife living in New York City in 1958. Her husband, Joel, is a businessman who moonlights as a struggling comedian at The Gaslight Cafe. Midge supports Joel, providing feedback about his sets, but becomes disillusioned when she discovers that Joel has stolen one of his best routines from Bob Newhart. One night, after a particularly unsuccessful performance, Joel confesses to Midge that he has been having an affair and leaves her. Midge goes to her parents for support but instead receives criticism for choosing to marry Joel and also the demand to persuade Joel to return. After drinking too much wine, Midge returns to the Gaslight Cafe and impulsively goes on stage, delivering an impromptu set about her predicament which the audience finds hilarious. After baring her breasts in an attempt to demonstrate how attractive she is, Midge is arrested and taken to jail for indecent exposure and performing without a cabaret license. Answer: Yes. Midge is a bored housewife that is prevented from being independent and taking care of herself. Answer: Yes. Midge is talented but in 1950’s America, it was almost forbidden for women to tell jokes. Answer: Yes. Her husband gets irate when he finds out. He even leaves her but for a different reason. She could have never done that it 1950’s America. Answer: Yes. The police pick Midge up for performing along with Lenny Bruce and she gets charged with indecent exposure for showing her breasts. I see Rocky as a straight up internal Performance with an internal Status > Sentimental genre piece. I will agree that there are elements of both the Hero’s Journey and the Virgin’s Promise but correlation does not mean causation since the fundamental requirements for a VP story are not met. Disagreement as to definition of terms. Ways this movie fails to meet the principle or could have done better. Better examples from other stories. Cautionary tale for novelists? Leslie – Reasonable minds can differ because we all bring our personal frame of reference, along with our current and long-term problems, with us to any story we read or watch. It’s vital that you figure out what a story means to you. As editors, we need to check our personal preferences at the door; the stories we edit are not our own. Writers often want us to tell the answer, though. Here’s my story, what genre is it? I can tell them what story is being telegraphed by the structure and content, but I can’t tell them what they meant to do, which is far more relevant. Your life will be far easier if you unpack your own preferences and figure out why the stories you love resonate with you. Anne – We all have different takes on the deep inner structure or meaning of this movie, and I suspect that’s a mark of a well-written story. Until last week, I hadn’t seen Rocky since it was new in theaters. I remember him drinking raw eggs, yelling “Adrian!” and running up some stairs. I had honestly forgotten most of the rest of it. What are the SG editors’ views on dividing a scene across a chapter—that is, ending a chapter at the crisis or climax so that the scene continues into the next chapter, versus ending the chapter on a scene resolution? Are there rules for this, or is it up to the writer? Jarie – Thanks for the question Heather. Dividing a scene across chapters has a lot to do with what you want to get out of story. If you want to put a cliff-hanger in that builds tension and then pays off in the next chapter, that seems fine to me. I think writers get into trouble when they do that too much. You can’t just be doing that all the time. It will wear the reader out. The reader does need a break from the action to regroup and catch their breath. How much of a break depends a lot on the story. The same with split scene cliffhangers. My advice would be to use it sparingly and only to really wow the scene or build the tension. If used sparingly, it’s a nice accent on a story. Kinda like using the f-word. A well placed f-bomb gives a nice spice to dialogue but too much just wears the reader out. Sure, if the character is an irish mobster, then more f-bombs are warranted but still, they lose their punch if misused. Good luck. If you have a question about the Virgin’s Promise plot, the Status-Sentimental genre, or any other story principle, you can ask it on Twitter @storygridRT, or better still, by going to storygrid.com/resources, then clicking on Editor Roundtable Podcast and leaving us a voice message. Join us next time to find out whether Jarie can make the case that the 1971 cult classic Harold and Maude is a great example of an innovative love story. Why not give it a look during the week, and follow along with us? This discussion is SO helpful. I’ve returned to it multiple times since listening to the podcast. Thank you, everyone, for the deep work you put into thinking about the virgin’s promise for our benefit. Thanks for letting us know, DC! I’m so glad this has been helpful to you!